MANCHESTER, Sporting Alert – Manchester United manager Louis van Gaal is delighted to have captured French teenage striker Anthony Martial, and labeled him as a natural talent. The English Premier League side confirmed the signing of Martial on dead-line-day of the summer transfer window for a fee of £36m from Monaco and Van Gaal believes Manchester United is the right club for the forward to continue his development. The pacey attacker signed for a four-year deal with Sky Sports reporting that there is an option to add another year. “Anthony is a naturally talented, young, multi-functional forward with great potential. We have been watching him for a while now and he has developed immensely during his time at AS Monaco,” the boss said on the club’s official website at www.manutd.com. “I am delighted he has joined Manchester United as I believe this is the right club for him to continue his development as a young player. 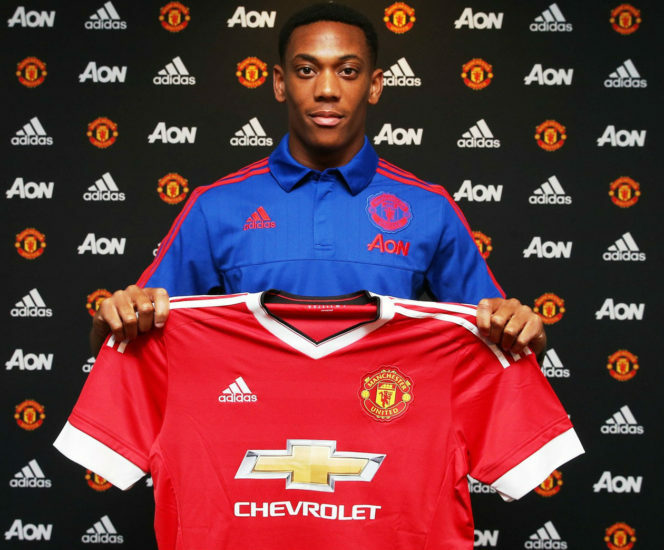 Martial, 19, has been likened to former France, Arsenal and Barcelona forward Thierry Henry and he can’t wait to start playing in the English Premier League. “I am so excited to be joining Manchester United. I have enjoyed my time at AS Monaco and I would like to thank them and the fans for everything they have done for me,” he was quoted as saying on www.manutd.com. “I have always wanted to play in the Premier League and to join the biggest club in the world is what every young footballer dreams of. Martial, after completing a successful medical, left Old Trafford to rejoin the national team, where he will be hoping to get his first international cap.